A crime-thriller with a supernatural twist! A crime-thriller with a supernatural twist. After being murdered on an archeological dig in Egypt, Lazarus St. George is returned to the land of the living by Anubis, god of the Afterlife, to serve as his agent on Earth. With eerie occult powers at his command, and with the aid of his loyal Egyptian friend Bobek, St. George haunts the evildoers of Tesla City as the half-dead avenger, The Wraith. “Visitations”: A deadly string of antiquities robberies claims its most recent victim – Lazarus St. George! “Rossini’s Luck”: Tesla City’s grim avenger faces the challenge of “Lucky Sal” Rossini, a local crime boss with supernaturally good fortune! “The Ghost Thief”: An amateur scientist unwittingly creates a machine that collects departed souls – including Persephone! 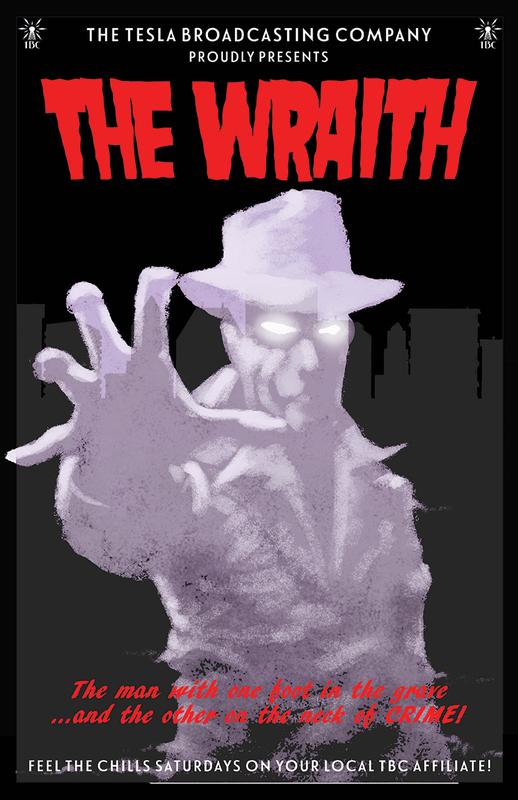 “A Suggestion Of Evil”: After an attack by an unlikely assassin, The Wraith matches wits and wills with a brilliant and powerful criminal hypnotist!